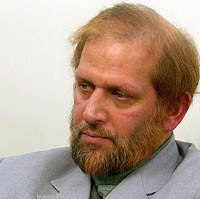 Ahmadinejad's Neo-Nazi adviser, Mohammad Ali Ramin, currently the Minister of Culture and Islamic Guidance Press Deputy, has come up with new threats against dissident journalists in Iran. Apart from show trials, long prison sentences, physical assault and extra judicial murders, Ramin threatened to strip the 'guilty' journalists from all their citizenship rights. 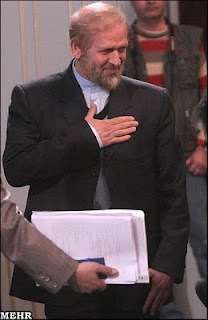 The picture below shows Ramin at the award ceremony during which SOAS lecturers, Anna Contadini and Mohammad Abdul Haleem received their awards from Ahmadinejad himself. Anna Contadini received an award in Creation of Human Values from Ahmadinejad! 'har dam az in bagh bari miresad' as we say in Persian. Word by word translation 'a new fruit arrives from this garden every moment' basically it means 'nothing ever surprises us any more' with these UK academics. Iran's current regime = 'Dark Mullahs.' Simply by cheating, oppressing and spreading state sanctioned murder. Khamanie = 'Satan's foot soldier' by thinking he is a divinity on Earth -due to having his hand kissed so much, he now thinks his arse should be too. Ahmandinejad = 'A Coward of the worst kind by having selective ignorance to intelligence.' He ignores the true voice of his people because a supreme ego has told him too! George Galloway = 'Lord Whore-Whore.' A Muslim who's also a wealthy capitalist who'll side with any tyrannical pay packet while advocating a hypocritical sense of justice thank you very much. And now Mahummad Ali Ramin just = a stoolie Himmler as another means to shut up the true Persian civilized, cultured, artistic and intelligence of the Iranian people up! I won't name all those who are the complete polar opposites of your posts Potkin. I respect their views. But that's just it isn't it? So do you... Enough to post them. But does the current Iranian regime have the same guts and open mindedness to do the same? No, because they ARE afraid! Because whenever a power becomes afraid of simple words, then there is only one damning word needed to describe them: Dictorship! how clear a true sense of justice is! Why should we..? WHY SHOULD WE excuse Khamanie and Ahmandinejad to use religion as an excuse to subjugate the good free will and spirit of a nation - just because they have crass, prideful and obscene male ego's! Ego's caught in the till of electorial cheating and so inflicts more oppression and supression to stop it being OPENLY found out??? How can ANY fair HUMAN BEING defend this? That's surely NOT what a truly great and totally humble God is all about? - WELL IS IT?